Jacob Fletcher and Van Gough. Photo by Liz Crawley Photography. Chattahoochee Hills CCI4*-S cross country was a race against the clock, and the only pair to come out in front of the buzzer was defending champion Jacob Fletcher with Van Gough. Jacob and Van Gough, an 11-year-old Irish Sport Horse gelding (Wivollet Vanbeek x Woodland’s Flight, by Laughton’s Flight) owned by Fletcher Farms, stormed around the cross country track to complete their rise up the leaderboard from 12th after dressage to 6th after show jumping, finally landing in the top spot after cross country on Saturday. 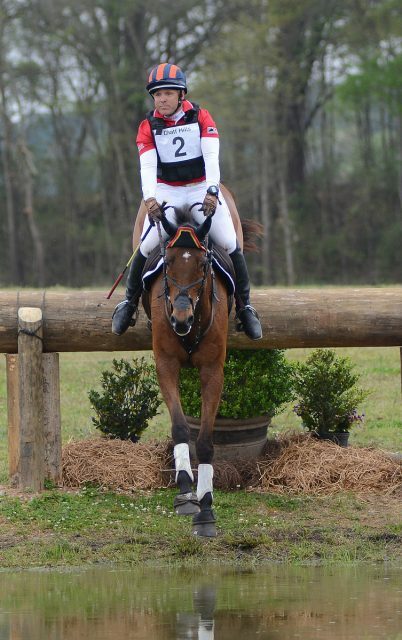 Jacob knows how to ride fast — in last month’s Red Hills International CCI4*-S, he and Atlantic Domino sat in second place after cross country as one of only two pairs to make the optimum time, and just the eighth pair to make the time in Red Hills CCI4*-S history. (Jacob withdrew the horse before the final horse inspection as he tweaked his fetlock.) With Van Gough, although their past cross country record has been checkered with time faults, lately something has clicked. “Even the times I’ve tried to go fast he’s gone slow, but he goes quite fast now,” Jacob says. In their last international outing in the CCI4*-S at Red Hills, they moved all the way up from 19th after dressage to 5th overall after collecting just a handful of time faults. 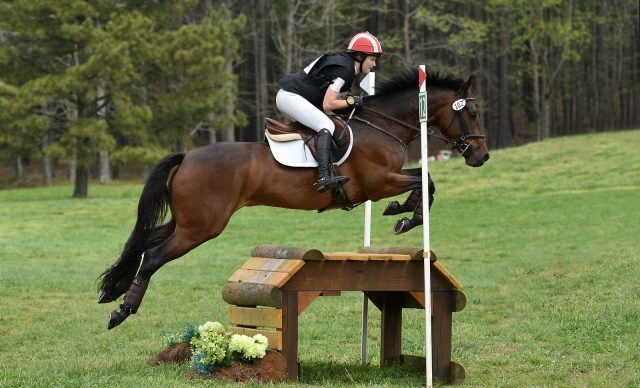 Jacob won the division last year with Atlantic Domino, a 14-year-old Irish Sport Horse (Dunlough Striker X Atlantic Amanda, by Glidawn Diamond) he co-owns with Frank Fletcher and Fletcher Farms. In 2018 they were the only pair to finish on their dressage score; this year, Jacob and Van Gough accrued only a 0.4 time fault in show jumping over the course of the event. 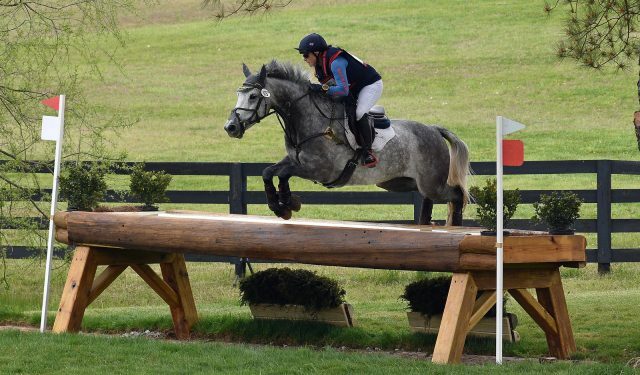 They were able to jump their way on up the scoreboard: “He’s very good at the show jumping, and jumped very well cross country.” The three phases added up to a win when all the top five combinations in front of him came off cross country with time faults. In addition to his win with Van Gough, Jacob also finished 3rd in the CCI3*-S with 5o1 Mischief Managed and 2nd in the CCI2*-S with 5o1 Wyly Girl. Next up for his crew is Jersey Fresh in May. Jacob’s only real miss of the weekend came during the awards ceremony, when the top three were given bottles of bubbly. He was surprised when he popped his bottle open with little fanfare — wasn’t it supposed to come fizzing out? “I thought geez, they gave me a dud,” Jacob says, not realizing that you had to shake the bottle before opening to make it spray. The runners-up were quick to douse the defenseless winner with entirety of their own bottles. Better luck next year, Jacob! Buck Davidson and Park Trader. Photo by Amy Griffith for Liz Crawley Photography. Show jumping leaders Buck Davidson and Park Trader, a 17-year-old Irish Sport Horse gelding (Master Imp x Ballyhast Polly, by Highland King) owed by Carl and Cassie Segal, picked up 7.6 time to finished in 2nd place. 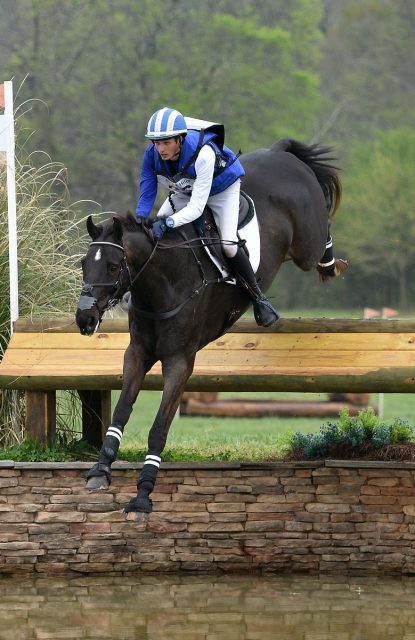 Always one of the busiest riders at Kentucky, Buck has four horses entered in the CCI5*-L later this month: Carlevo, Copper Beach, Jak My Style and Park Trader, all four of whom enjoyed a final run at Chatt Hills. 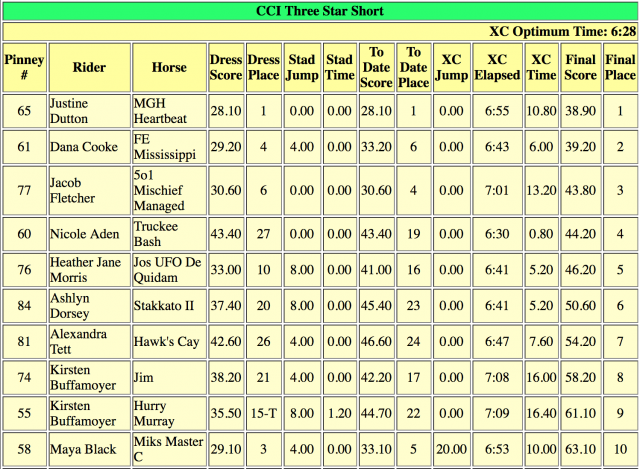 Copper Beach finished 8th in the CCI4*-S; Jak My Style won the Advanced, and Carlevo finished 4th. Rounding out the CCI4*-S top three is another veteran Kentucky bound pair, Ellen Doughty-Hume with Sir Oberon, a 17-year-old Holsteiner/Thoroughbred gelding (HQ Outrigger x Cher) owned by the rider and Alistair Hume. 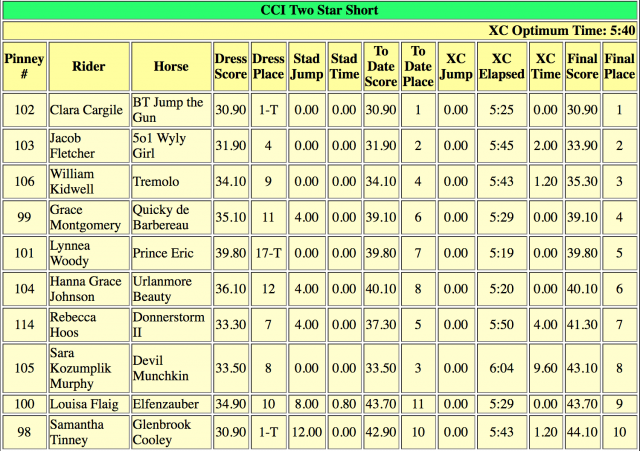 Like Jacob and Van Gough, they also made a big jump up the scoreboard, starting in 19th after dressage and finishing 3rd. Ellen Doughty-Hume with Sir Oberon. Photo by Amy Griffith for Liz Crawley Photography. Justine Dutton and MGH Heartbeat, her own 8-year-old Irish Sport Horse mare (Womanizer x Douglas Darco, by Ard VDL Douglas), took the CCI3*-S dressage lead on a 28.1 and held fast to it throughout the event. 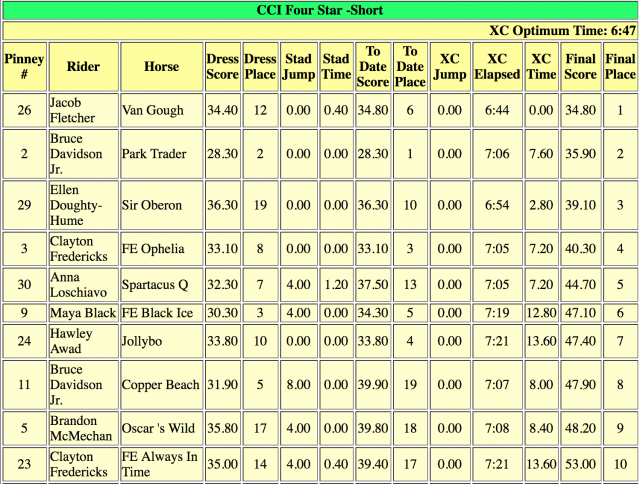 No CCI3*-S pairs made the cross country time, and Justine squeaked in for the win with 10.8 time faults. 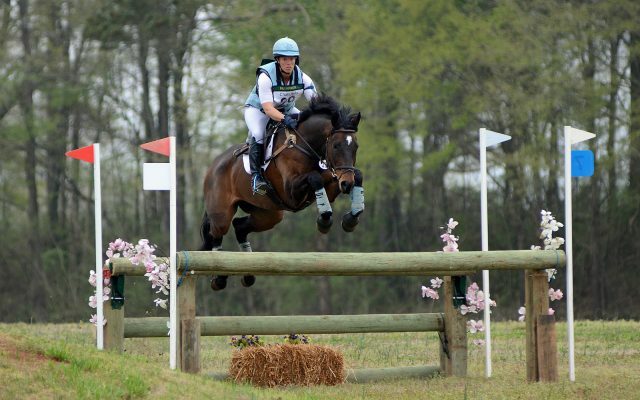 Justine Dutton and MGH Heartbeat. Photo by Taylor Crawley for Liz Crawley Photography. 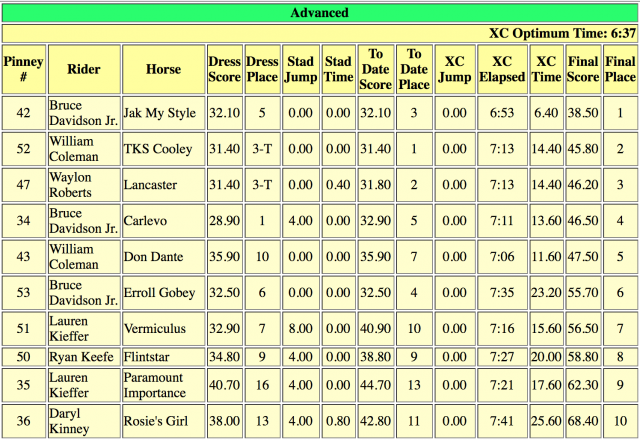 Clara Cargile and BT Jump the Gun, her own 7-year-old Irish Sport Horse (Copper Field x Fida Kahlo, by Cricket Ball), were tied for 1st after CCI2*-S dressage and sealed the deal with double-clear jumping rounds. Clara Cargile and BT Jump the Gun. Photo by Liz Crawley Photography.